Damn i should have grind VKA instead of P44 and M46. I should have known better. Because earning credits is such a waste. Edited by zlaja031, 09 February 2019 - 02:30 PM. LoOl. WG is actually trying to say that Tech Tree tanks are also good. Everyone who has played 1 battle against those tanks knows all those premium tanks are flat out better than Tech Tree ones. Lorr 40t is way better than 50 100. Skorpion G far better than Borsig and I don't think I need to talk more about them. Btw nice joke with Ferdinand. Some are. VK100 is very good if not the best HT. But it's too slow for the Frontline IMHO. But some recommendations are way too optimistic. I laughed so hard with this one!!! The articles get more and more entertaining!!!! Ferdinand: "Best used to attack, not recommended for defence because they are prone to flanking"
ROFL. This makes absolutely zero sense. If 2 tanks use the same crew, can you take both tanks into a game of frontilne? As long one of them is not dead in the ballte probably. You need 3 tanks or more to play between tanks that have the same crew. ... and you cannot go back to barracks, during the battle, to change the crews. Edited by TheArk_2014, 09 February 2019 - 06:03 PM. @Ontopic: I actually liked these articles. I think WG should write these more often. But the "All other SPGs/LTs" bit? Tch... The disdain for these classes intensifies. But yeah fast is better generally. I didn't see much defenders, patriots and libertes. Are WG deluding themselves into thinking people are going to use the underperforming regular tanks from the tech tree in this mode, when there's perfectly viable OP premiums to choose from? Here's an actual list of the tanks you will meet in Frontline: premium tanks. Load and loads of premium tanks. And some french tank wheeled vehicles. my CDC didn't make the top 25 it seems. 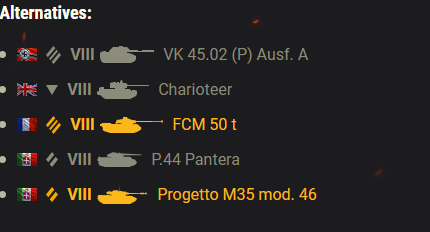 "Punchy Heavy Tanks" ... "VIII IS-6 "
Is it a joke or what? I mean the t10 is funny and all, but they actually recommend the AT15 for Frontline. Yeah one of the slowest and least manouverable tanks in the game is really what I want to play in Frontline.